Avalanche experts in Canada are working on a new project in hopes of helping recreational backcountry enthusiasts answer a question that could help save their lives: What would the pros do? The $1.02-million research spree comes as organizations such as Avalanche Canada continue to expand their outreach efforts, trying to broaden the range of folks who take their traditional and standardized safety courses. The research slice depends on academics; the expansion plans lean on professional skiers such as Leah Evans offering a cool factor to education. 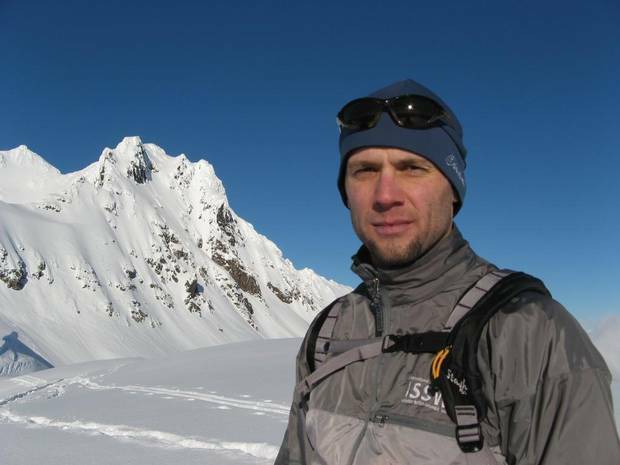 Pascal Haegeli holds the research chair in avalanche risk management – a new position – at Simon Fraser University. His team has the million dollars and five years to examine how skiers, snowboarders, snowmobilers and other mountain fans should best manage avalanche hazards. Avalanche information available to the public today provides technical information about snow layers, as well potential hazards relative to terrain. Mr. Haegeli wants to add another aspect by providing mountain fans – even experienced ones – with more refined guidelines on what type of terrain would be most appropriate under certain conditions. "Providing [recreational backcountry adventurers] with information about the snowpack alone isn't necessarily making them better decision-makers," he said. "The step from simply knowing about snow crystals to actually making [terrain] choices is actually quite a big step. So we're trying to address the challenge from a more intradisciplinary perspective and trying to put a focus on that risk-management process." To do that, the researchers will turn to industry professionals such as heli-guides, who decide what terrain is appropriate to explore based on the conditions of any given day. The researchers will track the data the professionals collect, examine how they assess hazards and then record what types of slopes guides consider safe given the conditions. Mr. Haegeli expects to then have enough data to correlate avalanche hazards with terrain choices. "Avalanches are not something that hit out of the blue. These patterns are fairly predictable. We simply want to get better at recognizing those patterns and make appropriate choices," he said. "We can make the backcountry safer by allowing people to make better informed choices." 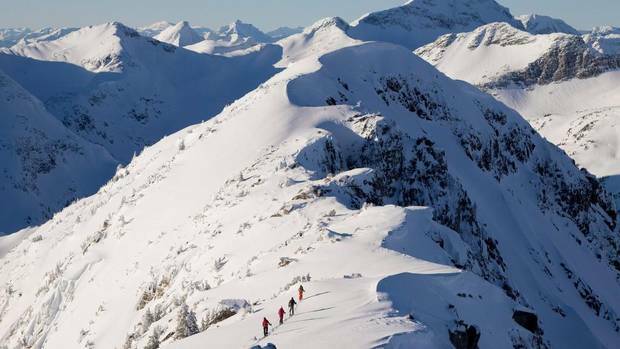 Six people have been killed in the Canadian backcountry this winter, and five of those were snowmobilers caught in a slide in the Robson Valley near McBride, B.C., at the end of January. 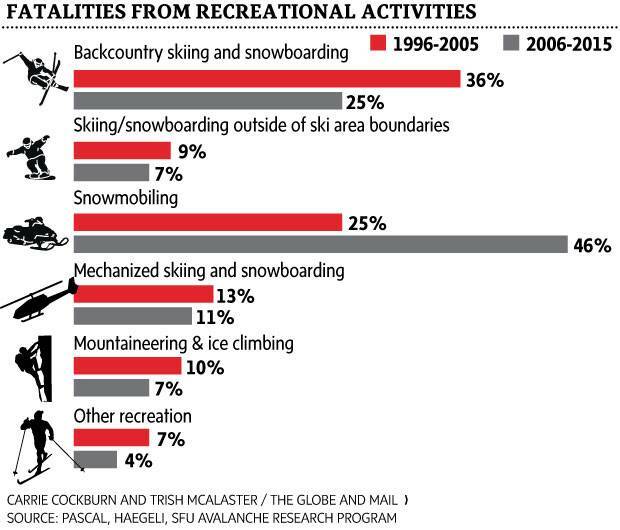 Backcountry avalanches from 2006 to 2015 killed 120 people, and 98 per cent of them were there for recreation. One-quarter of those were skiers and snowboarders; 46 per cent were snowmobilers; and 11 per cent were tied to mechanized skiing and snowboarding, such as cat-skiing or heli-skiing, according to Mr. Haegeli's research. Victims tend to be men in their 20s skiing traditional backcountry terrain, although that is shifting toward snowmobiling as its popularity rises. (In response, Canada's avalanche organizations have spent years reaching out to backcountry snowmobilers in the hope that they also jump on the education bandwagon.) Fatal avalanches are usually triggered by the victims or those in the victims' party. Meanwhile, professional free-skier Leah Evans teamed up with Avalanche Canada this winter to get more women 16 to 20 years old into traditional safety courses. And she is doing it for free. Pascal Haegeli, SFU Research Chair in Avalanche Risk Management, at Cayoosh Mountain north of Pemberton, B.C. The 28-year-old Ms. Evans owns Girls Do Ski and is a big name in the ski world. Men and women want to ski, jump and pounce around powder pillows like her. She knows that up-and-coming skiers admire her, giving Avalanche Canada a fresh way of drawing young women to its safety courses. "They run free youth programs, but they are like: 'We have no one apply. How come you get so many people to apply?' "
Easy. She is Leah Evans. "I'm in a role-model position and I want to be accessible," she said. "It makes a difference that we're not 50-year-old men instructing the course." Besides teaming up with Ms. Evans, Avalanche Canada is among those supporting Mr. Haegeli's research. Canadian Pacific Railway is pitching in $250,000 to help fund the project. The company's trains roll through avalanche territory in British Columbia, and slides put its business and employees at risk. "Research is imperative to ensuring the continued safety of our employees – both at work and during their recreational time – and improves CP's ability to maintain consistent, efficient service for our North American customers even in the winter," Martin Cej, a spokesman for the railway, said in a statement. Five years worth of information cannot provide a scientific sample, but the information Mr. Haegeli has gathered over the years as a consultant will add six more years worth of data. "We'll simply be able to maybe scratch the surface of it and lay the foundation," he said. "I don't think we'll be able to eliminate avalanche [risk], but we can give people better tools so that they can make the right choices and come back after a weekend."